Stevie Nicks' recent musical forays may find her mining the past to cast songs in a new light, but in so doing, she's forged a strong path forward, filtered through the wisdom she's gained. At United Center on Saturday, the icon breathed new life into decades-old songs, revisited early underrated treasures and peppered in megahits to satisfy superfans and recent acolytes alike in a two-hour set that reinforced that timeless songwriting endures. 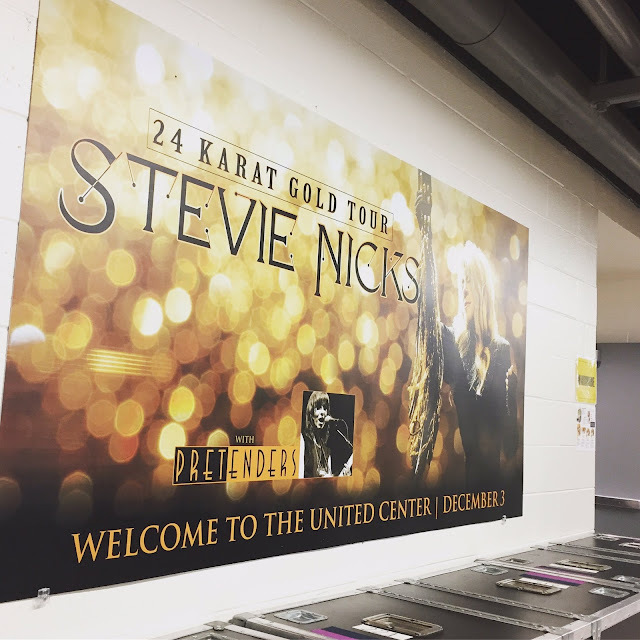 Nicks is currently on her "24 Karat Gold Tour," which features live takes on newly recorded, previously unreleased demos culled from her storied, 40-plus-year career, which appear on 2014's "24 Karat Gold: Songs From the Vault." The set also featured material from her first two solo records, 1981's "Bella Donna" and 1983's "The Wild Heart," which were reissued last month, as well as some of her Fleetwood Mac songs. And though the latter material, which included an affecting "Gypsy" and a rousing, extended "Gold Dust Woman," were fan favorites, there was a certain freedom to be found in her solo work. Nicks is a perpetual role model: a trailblazer who's had a valiant career alongside her trials, from overcoming substance abuse to tangled relationships, and come out stronger. Nicks' mystique and bewitching charm permeated the show, from her signature flowing black dress paired with shawls and capes to her trademark twirls and sultry rasp with its enchanting, indelible hue, though time may have slightly compressed her range. She also pulled back the curtain on the origins of many songs, which added a rare, welcomed intimacy to the set. This gave insight into tunes such as the standout "Starshine," which she wrote in Tom Petty's basement, and the disco-fueled "Stand Back," which was inspired by the late Prince. Her humorous admission about the oldest song in the set, 1973's Buckingham/Nicks song "Crying in the Night" ("At 22, I don't know where these words came from") showcased that her poetic musings don't have to be literal to evoke emotion. "Wild Heart" and a sterling "Rhiannon" were also highlights. Songs such as the affecting set closer "Landslide" and "Edge of Seventeen" sagely referred to the passage of time. Though written three decades prior, these songs' themes of love and loss seemed to resonate more deeply with age. The soothsaying chanteuse's gifts extended to her choice of collaborators. Chrissie Hynde — whose stunning voice buoyed her rocking opening set with The Pretenders, which also included timeless hits ("Brass in Pocket") and newer gems ("Alone") – joined Nicks for the awesome "Stop Dragging My Heart Around." Hynde also discussed religious tolerance, the only political statement of the night, before performing "Holy Commotion." In an era that can be rather antagonistic and ageist, particularly towards women, both Nicks and Hynde's performances were empowering. Beyond surviving, they've persevered, and continue to excel at their craft. "Crazy as life is," Nicks advised at the end of the show, "Stay in the path of love."